For centuries, people have used gold as an integral part of their investment portfolio. 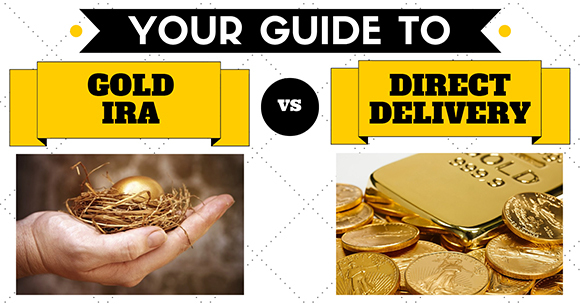 To invest in and own physical gold, there are generally two methods that are utilized: direct delivery or a gold IRA. Each method has a unique process associated with it and different advantages and disadvantages. To help you decide which one best fits your needs, we’ve created a graphic comparing the two methods. Direct delivery occurs when an investor uses funds that are not part of his or her retirement account in order to acquire the precious metal. The gold is then shipped directly to the investor. In order to complete this transaction, the investor typically contacts a broker of precious metals and specifies the types of bars and coins that he or she would like delivered. Then, the investor usually completes a wire transfer of funds. The investor must find a safe location to store the metals and coins. In contrast, a gold IRA is a retirement account that holds precious metals. The investor uses funds out of his or her own retirement account. This option requires much less time and personal involvement from the investor because funds are simply rolled over from the existing retirement account. The investor does not have to complete wire transfers. While direct delivery provides a greater range of metals that can comprise the investment, there are still plenty of products available for gold IRAs that meet the minimum requirements established by the Internal Revenue Service. The metals and coins are stored in a depository that is sanctioned by the IRS. Although the investor has to pay for storage fees, he does not have to worry about coming up with a safe place to store the precious metals. American Bullion, Inc. helps to convert existing retirement accounts to gold IRAs. We have helped thousands of clients to convert their accounts in a hassle-free and tax-free manner. See our graphic below, and don’t hesitate to call us at 1-800-326-9598 if you have further questions.